U.S. Air Force Director of Cyberspace Innovation Lauren Knausenberger, WG’12, made the transition from government contractor to entrepreneur to one of the youngest senior executives at the Pentagon. 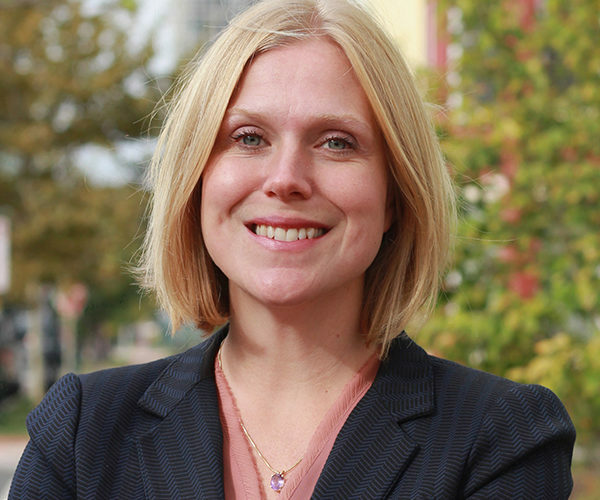 As civilian director of cyberspace innovation for the U.S. Air Force, Lauren Knausenberger, WG’12, works on a diverse portfolio of initiatives that already have begun to ignite positive change in the Department of Defense. Take, for example, the Spark Tank program — a concept similar to Shark Tank with six finalists in uniform pitching their ideas to a panel of Air Force senior leaders and industry partners to compete for funding. The competition is just one of many ways that Lauren is helping to drive innovation across the Department of Defense, speed the adoption of emerging technologies, and create stronger partnerships between the DoD, start-ups, and the venture community. Since she took on the role in 2017, Lauren has earned a spot on the 2018 list of top Women in Tech as well as the prestigious Doolittle Award for inspiring Air Force innovation. Lauren is also looking at major roadblocks to the adoption of technology, like the DoD cybersecurity accreditation process. “Cyberspace capabilities and threats are changing at an ever-increasing pace. If we wait a year to test a new capability in the old way, it’s already obsolete by the time we use it, and we have often asked the wrong questions,” she said. Lauren recently signed a policy memo that allows top-performing Agile development teams who use an automated pipeline and approved processes to have continuous authority to deliver their products immediately to their users. It was this kind of thinking that landed Lauren a role as one of the youngest senior executives in the Pentagon. Founded in 2014, Accellint focused on solving national security challenges and invested in commercial technologies that could provide value to the government mission. The company grew quickly, and Lauren enjoyed the work and the flexibility. “Just as I felt things were fully in balance and I knew exactly what I wanted to do, life threw me an interesting curveball,” she said. Lauren had been working with the U.S. Air Force to help develop an innovation framework to speed adoption of emerging technologies and perpetuate a culture of innovation. The plan was to hire a retired military officer to establish a new office focused on cyberspace innovation and for Lauren to provide advice and outside perspective as a civilian expert. However, that plan changed when she received an unexpected call. “The CIO told me he had been inspired by my passion for the problem set and my fresh perspective on where we could go, and that they wanted to pivot to a new leader and new way of thinking,” Lauren said. He asked if she would consider a senior appointee role in government. Although Lauren was hesitant to change course from her entrepreneurial path, the position was too good to pass up. “It is so fulfilling to be able to serve this mission and do my best to make a big difference for our country in driving innovation, saving tax dollars, and encouraging Airmen to reach their potential,” she said. Founder and President of Accellint, Inc. Working for a defense contractor, Lauren came to Wharton’s MBA Program for Executives to expand her network and explore new areas. “I was intrigued by entrepreneurship and innovation at a high level, but I didn’t know where to start. In many ways, I had been living in a D.C. federal government bubble,” she said. She explored several possible paths at Wharton, including starting her own company. After graduation, Lauren started a family, earned a promotion, and had great success driving aggressive growth at her firm, but the long hours meant less time with her two young daughters. That’s when she decided to launch Accellint and create a position that infused her passion with her strengths — and gave her the flexibility to spend time with her family, too. Lauren credits Wharton’s EMBA program for providing her with the building blocks to help successfully launch Accellint.